This is a project I started while a graduate student at California College of the Arts. I still had memories of my Mother and Father, who both passed away in recent years. Art helped me so much in the process of grieving. I was attending the San Francisco Art Institute at the time, and I often made work exploring my emotions, and finding hope and inspiration in the work I made there. I hope the Griefcase, making this work, and exploring the work of others will help the visitors and creative explorers of the case in their moments of healing and transition. Griefcase is a case of art materials (pastels, glue drawing tools, and paper) circulating in the public that has instructions of how the drawings can be used to express grief and emotion. 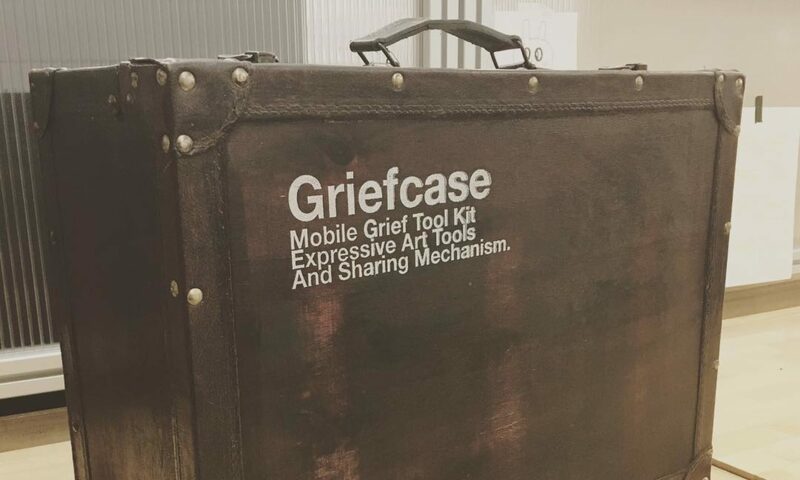 The hook of this mechanism, though is that everyone who has made art before in this way using the suitcase will have placed their drawings in a folder on the inside of the case, that can be accessed and reflected on by everyone who gets the case, so they feel more connected to the community environment in their moments of sadness. After making a work, the artist gets to keep one of the drawings in the case, and gives their work to the community by placing it in a shared folder. It’s a direct giving and receiving so that the memory of shared experience can remain. Here are some photos of the final case.